Welcome to Casas del XVI. Long ago, old world explorers founded the city of Santo Domingo as the first permanent settlement in the new world. 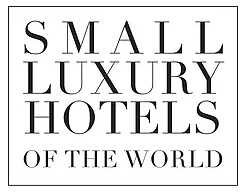 A unique hotel where old world romance combines with the utmost in modern luxury and comfort. Represents the juxtaposition of antique and modern structures that harmonize in the Colonial City. 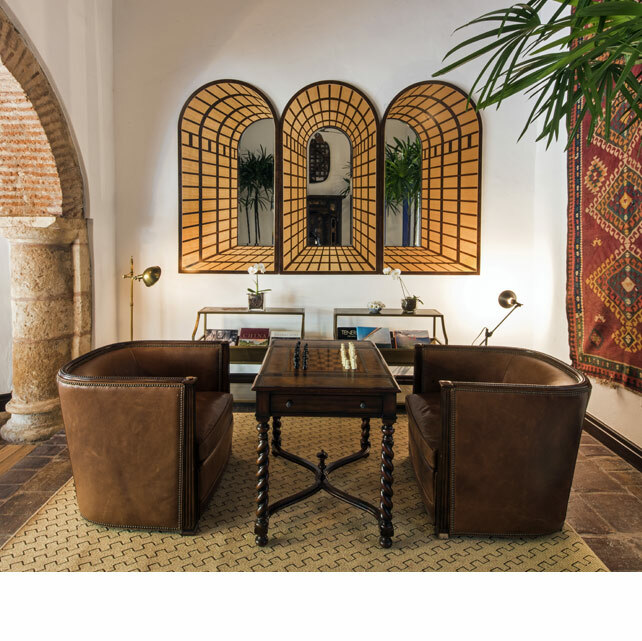 Casa del Pozo is outstanding: all that is antique is preserved, and the new structures are modern, highlighting the value of its centenarian foundations. 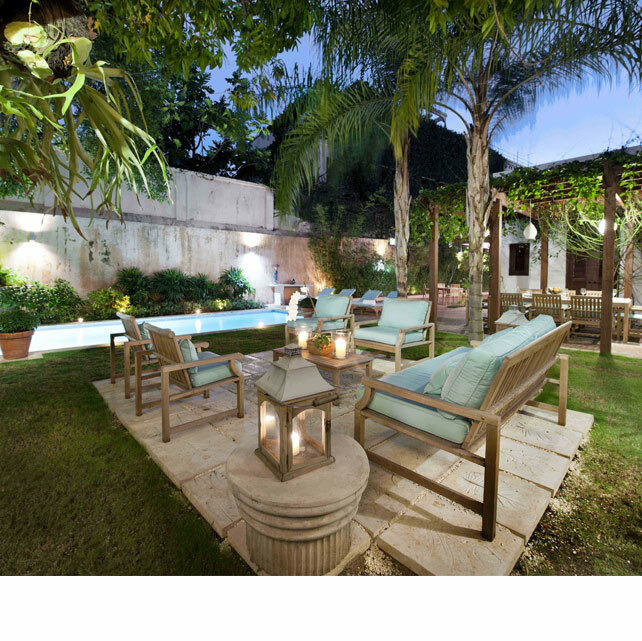 The house features six luxury rooms with center courtyard with an outdoor lounge area and swimming pool. Architecture: An impressive colonial structure dating to the 16th century nestled within the former grounds of the Convent of the Dominican order. Name Origin: Tribute to the ancient well that was found in the courtyard. Concept: A great city dwelling where history and present-day life coexist in harmony. Design: Opposing colors, black and white, juxtapose with surprising touches in other different tones. 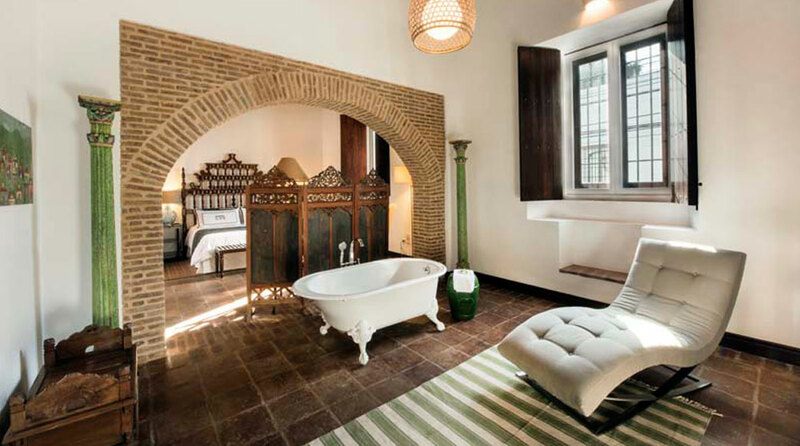 The wood and antique plasters coexist in the different social areas and bedrooms. Culture: Historic and architectural preservation. 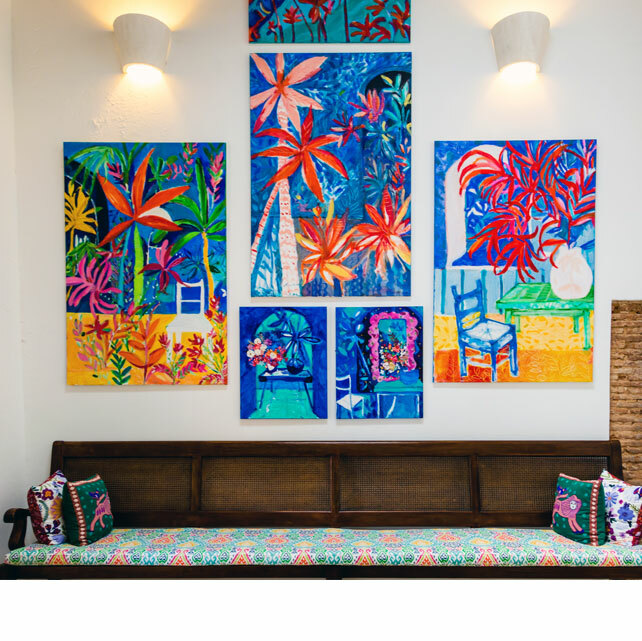 Casa del Diseñador is a tribute to the great fashion designers of this beautiful Caribbean island. 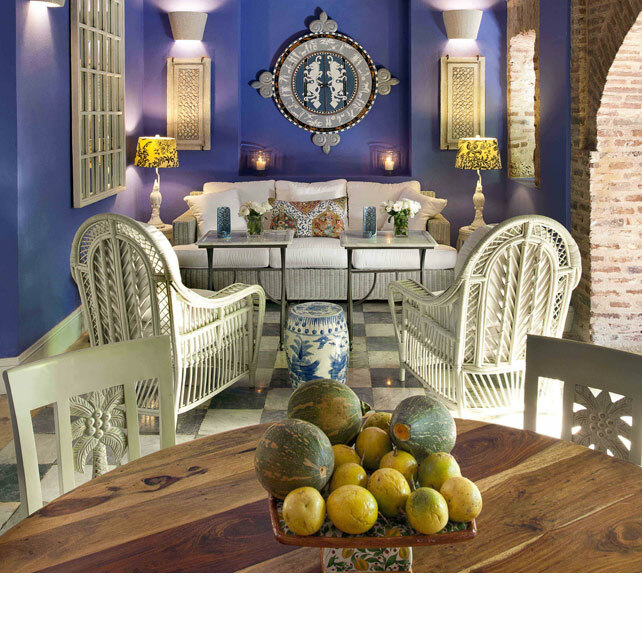 Upon opening its doors you will be transported to the 16th century, where elegance, comfort and privacy converge. 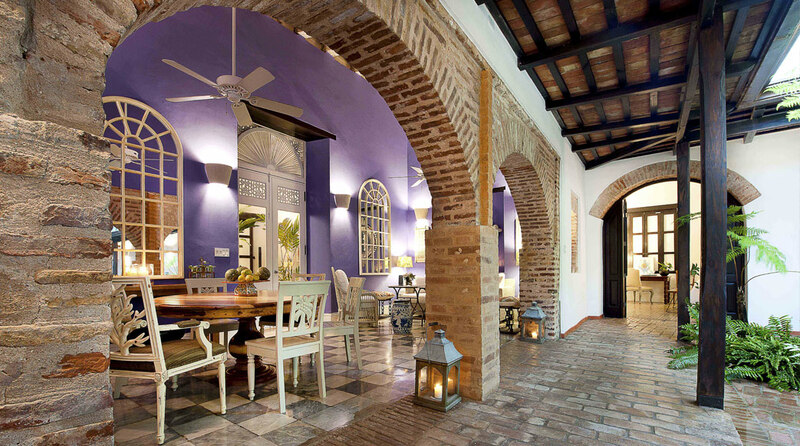 Architecture: The house occupies a space within the ancient walls of the garden of the Convento de los Dominicos. It shelters an original arch dating from the 16th century. 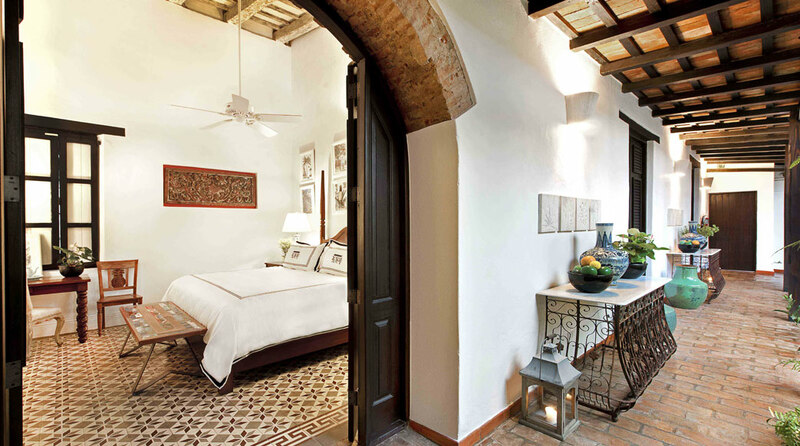 All of its rooms lead to the large terrace and tropical patio with plunge pool and lounge chairs. 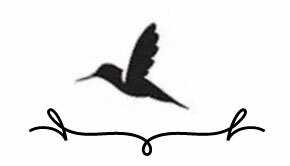 Name Origin: An homage to the greatest designers of the Dominican Republic. Concept: Quiet elegance, provides a feeling of seclusion and privacy. Design: Wash of neutral colors in the main areas and an intertwining mix of bright colors in the bedrooms, light fabrics and tropical flare are used in the designs made especially for this house. Culture: Classical music, fine arts and design. 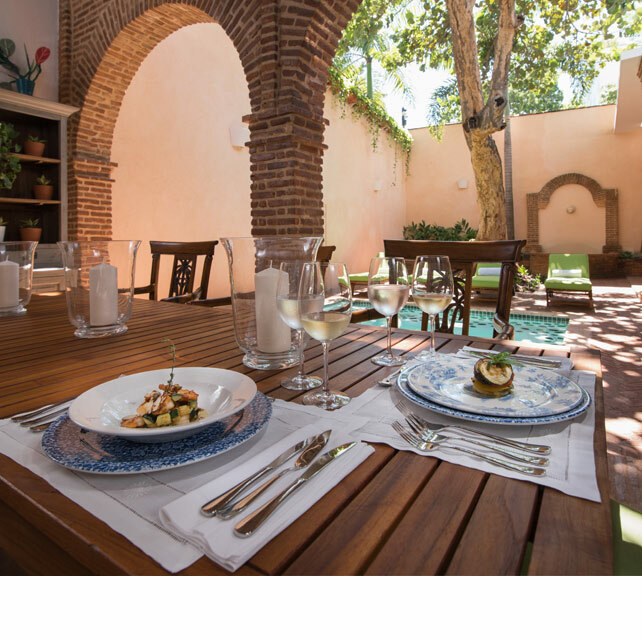 Centuries ago Casa del Árbol was the home of the architect who implemented important restoration and civil works in the Colonial City. Original grey and white marble floors remain in the house reminding us of its former glory and its connection to the first Cathedral in the new world. 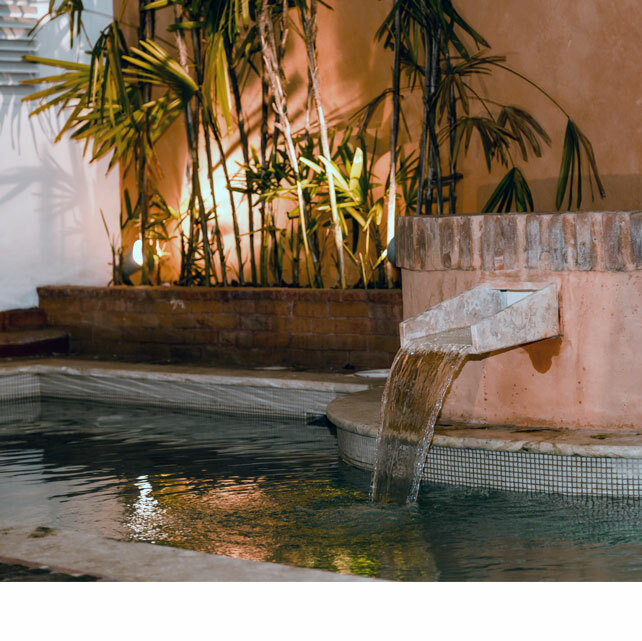 All the rooms open to the tranquil central courtyard where you can enjoy the beautiful song of tropical birds resting nearby or at the house’s lush mango tree. 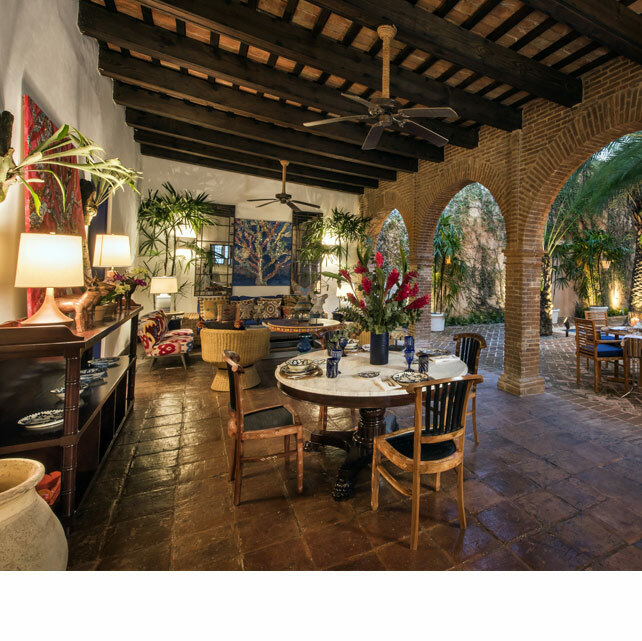 Architecture: A colonial gem with a true Spanish interior patio surrounded by walkways and terraces. Name Origin: Named after the courtyard’s mango tree. 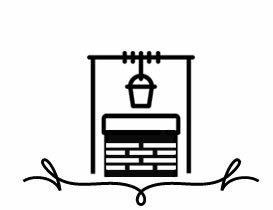 Concept: Conveys the pineapple theme, a colonial symbol of hospitality. 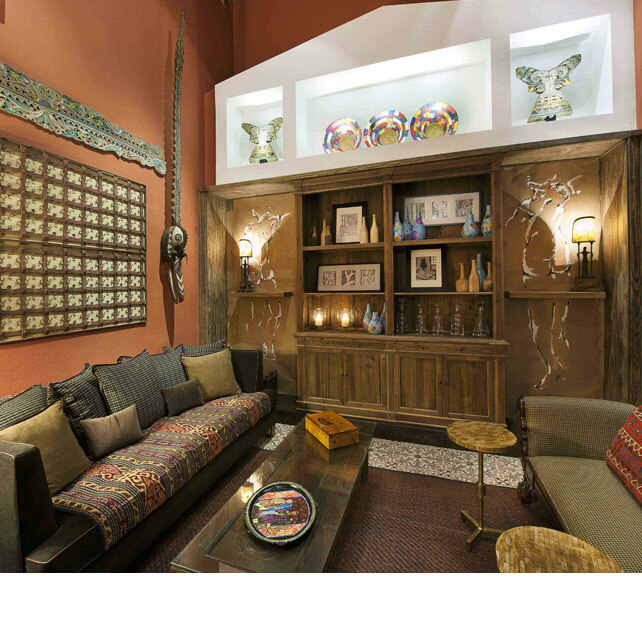 Design: Eclectic spaces combine local artwork and contemporary furniture, warm colors. Culture: Nature, cigar & liquors, gentleman’s sports. 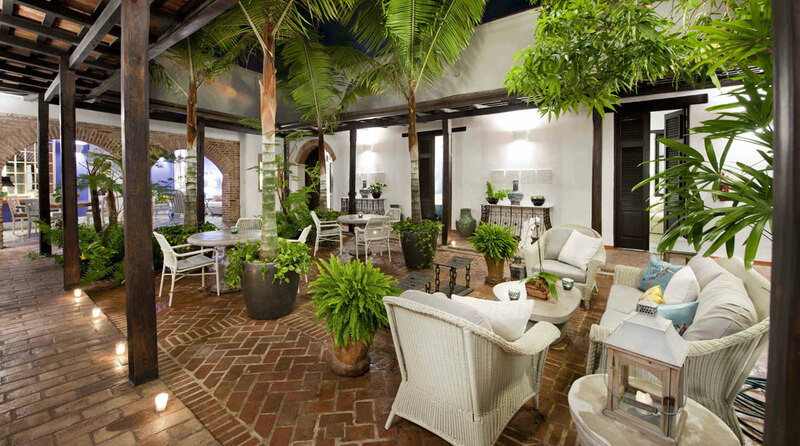 The original structure dates to the Spanish colonial era. 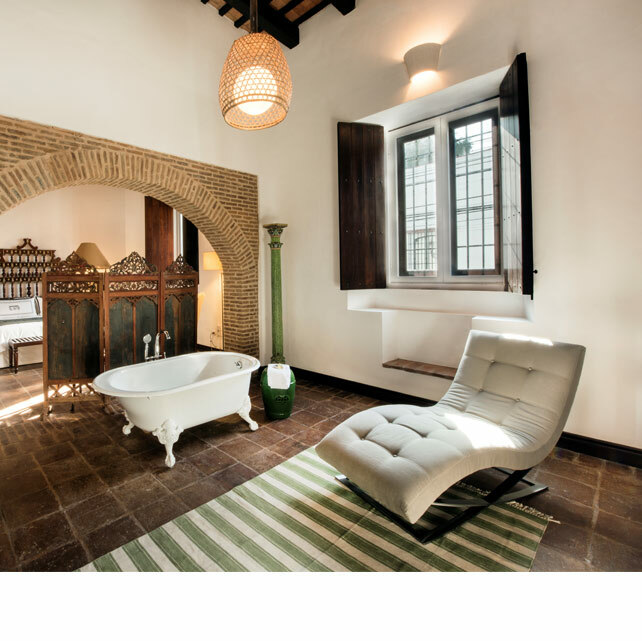 Located on the grounds of the former Dominican Monastery, successive uses and restorations have transformed the house, surpassing its original state. 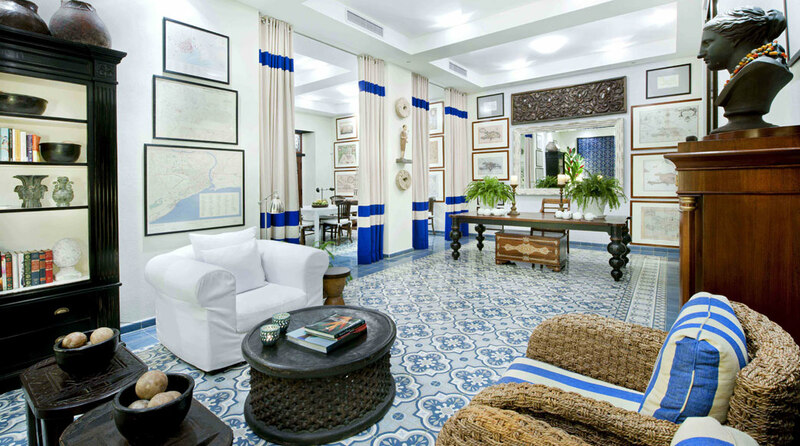 Vintage maps, plantation-style furniture and richly patterned floor tiles create a colonial-tropical ambience. 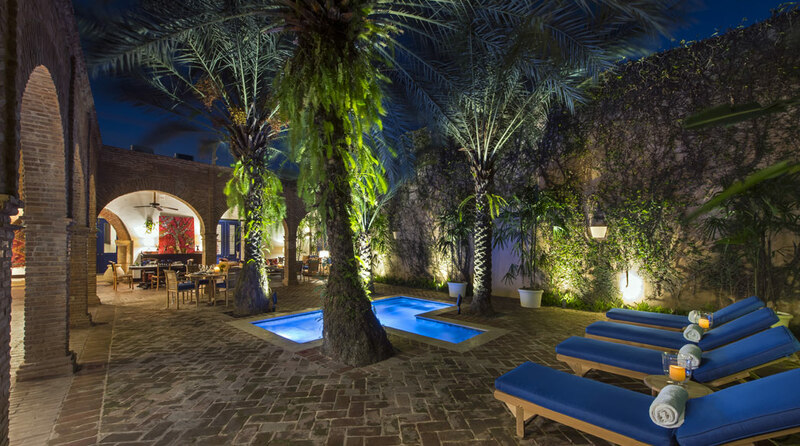 Guests may enjoy its lush open courtyard and refreshing swimming pool. Architecture: This home feels tropical all around. 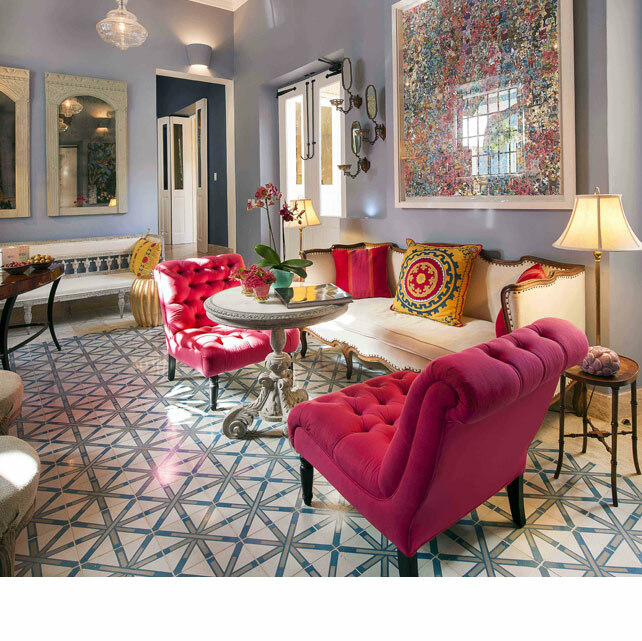 Spacious, bright and colorful rooms mirror the nineteenth century. 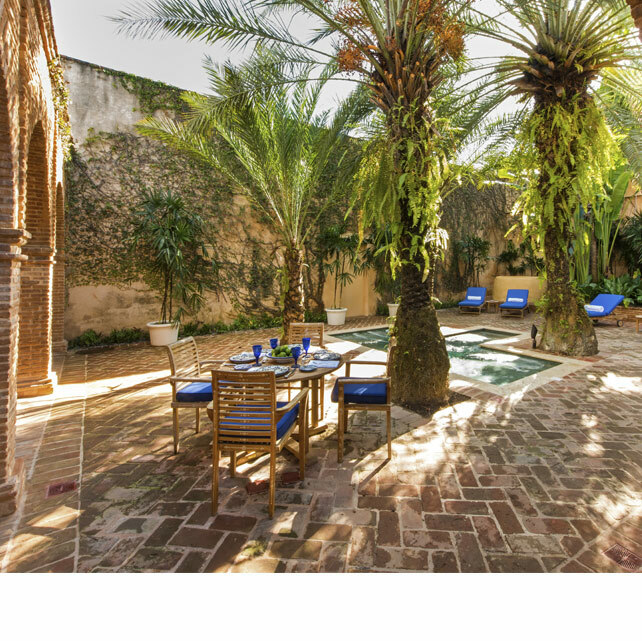 A large central courtyard with a pool flanked by lush tropical vegetation. 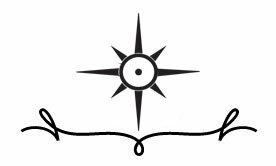 Name Origin: A journey from the sixteenth century to the present day depicted by the adorning maps of Hispaniola, the Colonial City, and the Caribbean. 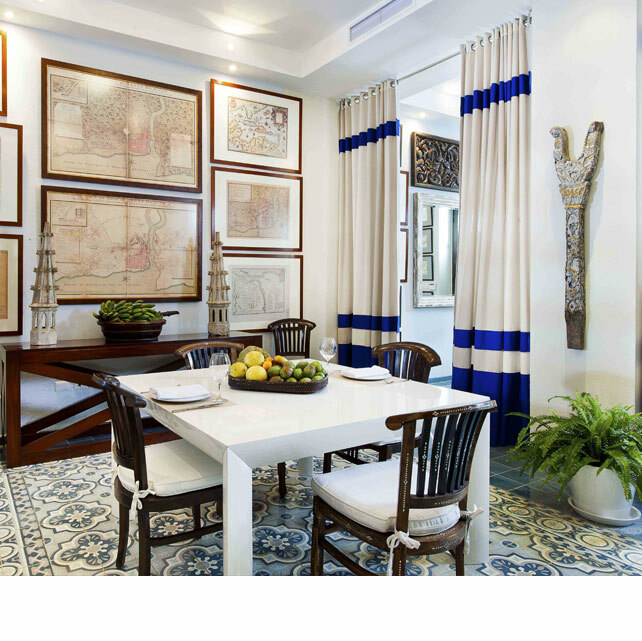 Concept: Nautical, colonial, tropical feel. 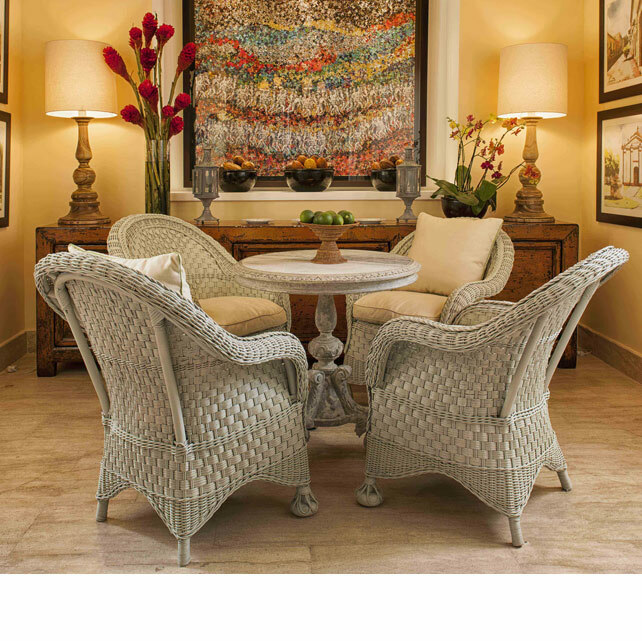 Design: Rustic and refined; intricate carpets, handmade crafts and modern paintings that evoke the architecture of a distant past. Culture: Historical exploration, the Colonial City. 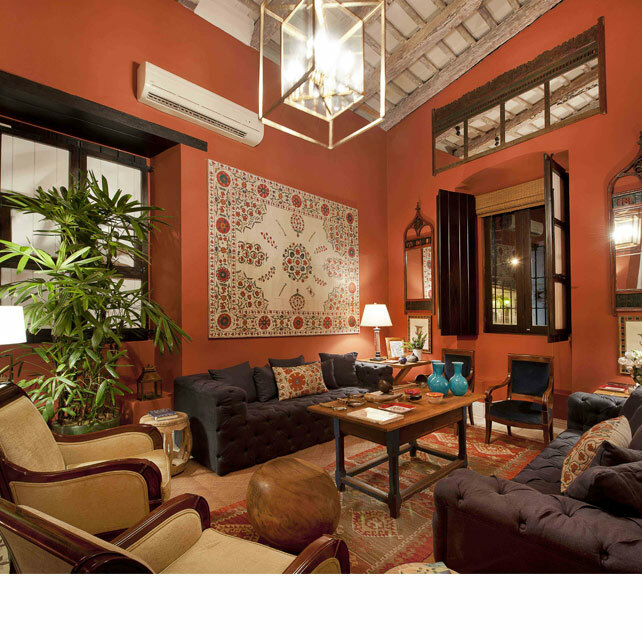 Casa Macorís is in one of the most charming locales in Santo Domingo’s Colonial City. 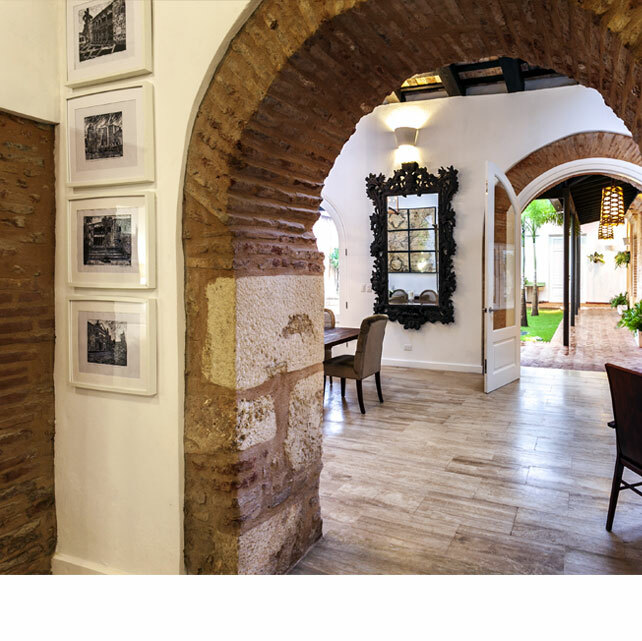 The house was part of the historical Convento de los Dominicos, which still stands today just a few steps away. Here time passes with serenity, marked by the chime of bells from nearby churches. 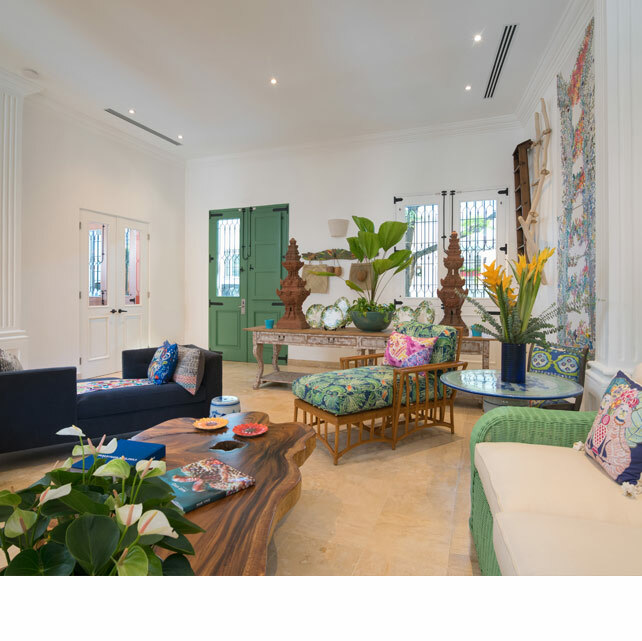 The house features a welcoming and colorful interior and a central garden with plunge pool designed to isolate the home from the heat and sound of the bustling streets. 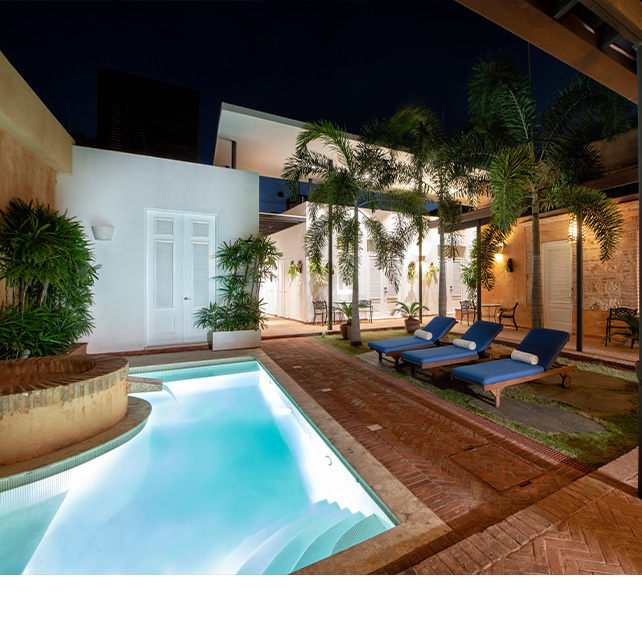 Architecture: This house is a assembly of beautifully decorated rooms that seamlessly lead the guest from one space to the other, from a lounge area to a dining room and sitting area, to two interior patios with one plunge pool. Name Origin: Macoris is a word that echoes throughout the history of the island of Hispaniola and in the past and present of the Dominican Republic. Concept: Honors the history, heritage and Dominican identity. 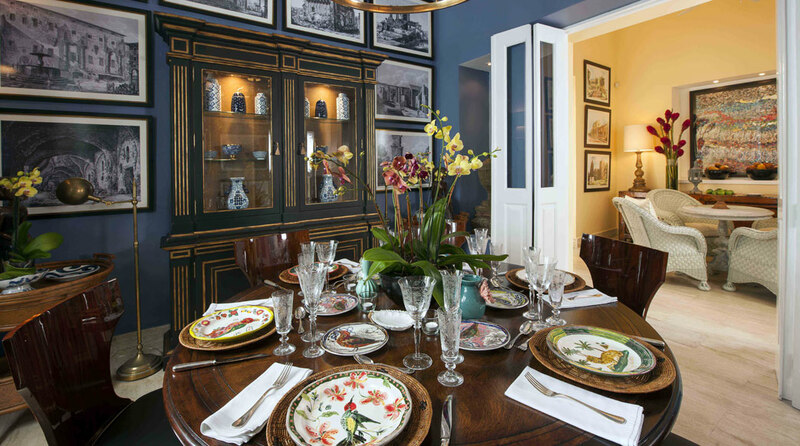 Design: Bright accent colors throughout all the spaces, whether they are found on the walls, furniture or house decor; local modern art displayed throughout. Culture: Dominican folklore, colors, art and music. Casa Antillana exudes a colonial Antillean design theme celebrating the tropical ambience found in the Caribbean islands. 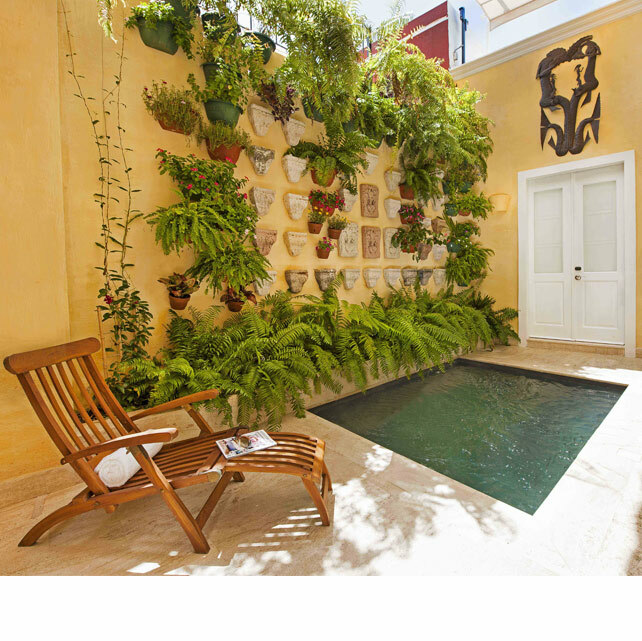 The house features a lush interior garden anchored by a large sea grape tree and an ornate plunge pool. Architecture: From the entrance we can anticipate what lies inside. 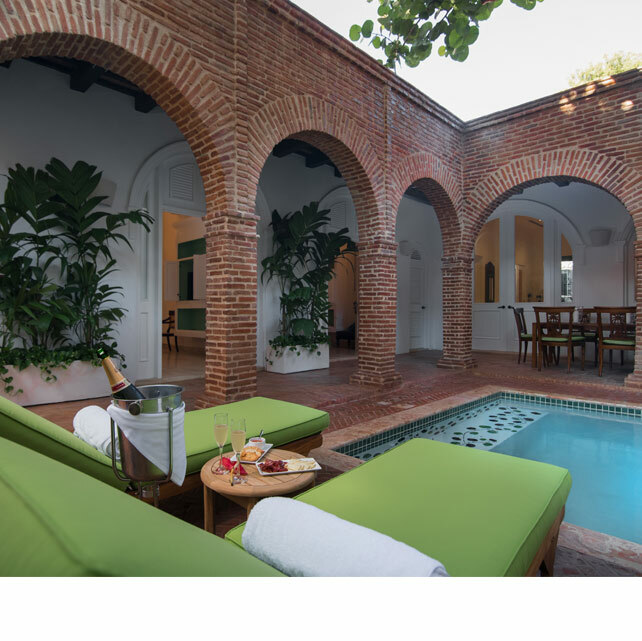 The door is an intense green and is framed by a white portico that respects the antique colonial masonry. Upon crossing the threshold everything is brightness, the main room opens to the interior garden through large white doors. 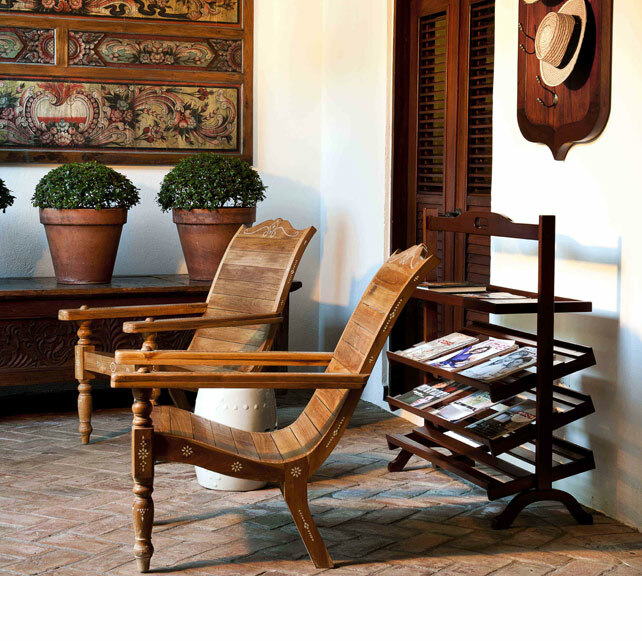 Concept: Tropical, colonial Antillean, main inspirations behind Patricia Reid’s majestic interiors at Casas del XVI. 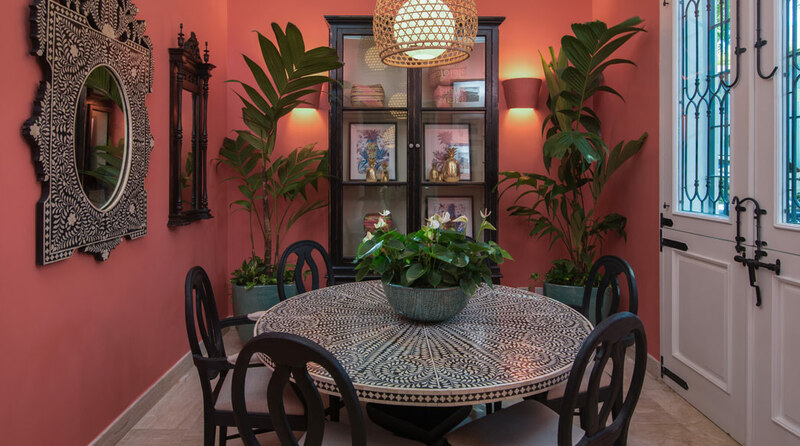 Design: Plantation style décor, white walls intermixed with touches of color, as well as natural materials, woods, embroideries and tropical prints. 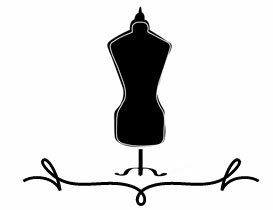 Culture: Antillean music, cuisine, fashion, art, allegories.